Synopsis: The purest intentions can stir up the darkest obsessions.In this prequel to Mary Shelley's gothic classic, Frankenstein, 16-year-old Victor Frankenstein begins a dark journey that will change his life forever. Victor's twin, Konrad, has fallen ill, and no doctor is able to cure him. Unwilling to give up on his brother, Victor enlists his beautiful cousin Elizabeth and best friend Henry on a treacherous search for the ingredients to create the forbidden Elixir of Life. Impossible odds, dangerous alchemy and a bitter love triangle threaten their quest at every turn.Victor knows he must not fail. But his success depends on how far he is willing to push the boundaries of nature, science, and love - and how much he is willing to sacrifice. There have been numerous attempts at creating pre- and sequels to Mary Shelley’s beloved Frankenstein, and I myself have not read any of them- or the original, for that matter (terrible of me, I know! But I have studied parts of it in English, so I’m not all foreign to its nature). Kenneth Oppel takes it from a different angle, and This Dark Endeavour starts where it all begins: in the Frankenstein family house when Victor and Konrad are 16 year old twins. This Dark Endeavour is in no way as dark as it is made out to be. I was expecting, from both the cover and the blurb, a gritty, haunting story of dark power struggles, but the reality is somewhat different. 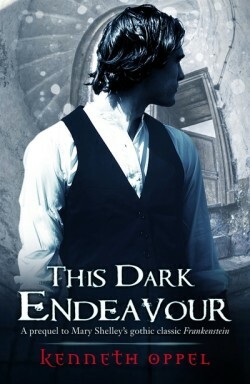 This Dark Endeavour is far more of an adventure story than gothic horror. That doesn’t mean to say that it wasn’t enjoyable, because it was- greatly so. It would have been nice to see a darker inkling running throughout the novel, but even without, it makes an entertaining read, and I have a feeling that things will darken considerably in the sequel. Told through the first person perspective of Victor Frankenstein, This Dark Endeavour features a somewhat stilted and, well, old-fashioned way of speaking- and what more to expect from a book set in the 1800s? I have a hunch that Oppel has tried to replicate the voice of Frankenstein in the original classic (though of course, I cannot confirm this! ), and it would make sense to do so. Luckily, this style doesn’t obstruct the raw emotions that flow throughout the novel (jealousy playing a major role), and as such the characters are still very much alive and kicking and great fun to read about. One particularly touching emotion is (unrequited) love- which doesn’t take centre stage but at the same time plays a major part in the plot. This Dark Endeavour touches heavily on (at the times, modern) science, religion, and alchemy. Rather than presenting alchemy as fantastical or magical, Oppel presents it as a forbearer to science, which it essentially was. Victor’s strifes about religion with his Catholic cousin Elizabeth are also tastefully done, presenting both view points in the same detail and without bias. This Dark Endeavour features both a fantastic title and cover, which fit in with the content of the original Frankenstein. Kenneth Oppel has crafted an intriguing and exciting prequel to Frankenstein, with great characters and well written prose. I can only look forward to the sequel, which This Dark Endeavour hints to be far darker and mysterious, something this first novel may have lacked in parts. What did you think about This Dark Endeavour?